Disclaimer: We are part of the campaigning bloggers promoting the release of the film described in this blog post, alongside Allied Contigo. Although we may or may not be compensated for sharing this information, all opinions are 100% our own. Any and all promotional photos and information were provided to us for press purposes. We received a complimentary digital copy of the film described in this post in addition to means for the healthy snacks. 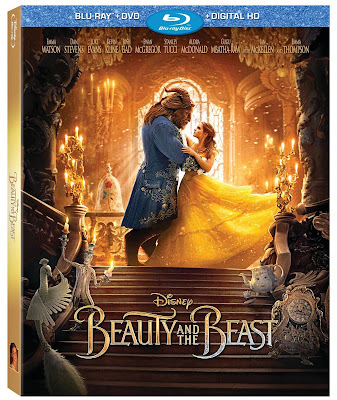 We are celebrating the upcoming release of Disney's Beauty and the Beast live-action film on Blu-ray/DVD and HD at Just Happiling. While we are waiting for the big movie night, we are sharing our movie inspired healthy snack ideas, freebies, and a very easy to create craft also inspired on the film, with all of you. Not only that, but one of our amazing followers will also be enjoying this film, by participating through a giveaway that we will be hosting through this blog post. We hope you enjoy our ideas, and that you join us in this celebration too by commenting with your thoughts on the film, favorite healthy snacks your family enjoys, and any other thing related to this post. There is no doubt that Summer is finally here, and with it, we usually seek refreshing snacks to indulge ourselves. However, with the kids spending more time at home during the Summer break, we want to make sure that those snacks are as healthy as possible. That is why, during this season, we tend to have loads of fruit around the house. Nonetheless, if you get a little creative, you can make a lot of fun snacks, with basically the same ingredients, and delight your family and guests. Since we are getting ready for the Beauty and the Beast's movie night, we went for fruit that had yellows and reds, mostly because of Belle's dress, and the Enchanted Rose. So we chose to go with strawberries, pineapple, and mango. However, raspberries and bananas are great choices too. We also went for cucumber, since it tends to be a very refreshing fruit for the Summer, and personally, my favorite snack. Shortly you'll see why I chose this one for this movie night. Strawberries - You need about 2 packs. You will be using them for; popsicles, the Squash/infused beverage, and to carve and decorate your plates. Mangoes - You only need 1 or 2. Pineapple - We will only be using 1 pineapple for the "Squash", which is technically only fruit-infused mineral water. Greek Yogurt - We buy Organic or Non GMO, but you can choose whichever Greek Yogurt you want. If you want to buy flavored Yogurt, you will not need the sweetener, since it tends to come sweetened already. Just make sure that your yogurt goes well with the fruit you will be using. Peach, mango, strawberry, or vanilla will go well with what we are creating. Tumeric powder - You will only use about 1/4 Tsp as a natural dye, but you don't need it. Sweetener - I normally use agave, honey, or coconut nectar, but you can use your favorite. Mineral Water - Your choice of mineral water. I like a brand that comes from Monterrey, MX (my hometown). Pink Juice - This can be your choice of Pink Lemonade, Raspberry Lemonade, and/or Watermelon. Cucumbers - As many as you want. You will use them to create decoration for your plates, but you can also serve them sliced and that works perfect. Big Jug/Jar/Drink Container - make sure that it is big enough to add your fruit and mineral water. Start by washing your fruit adequately. Then divide your strawberries in 3rds. You will need one third for each project; popsicles, Squash, fruit flowers. 1. Slice the strawberries into thin and small bits. I like to choose the smaller strawberries for this. Do the same with 1/3rd or less of the pineapple. While you are at it, you can also slice your mango. It doesn't have to be perfect, as you will mash/puree the mango. 2. 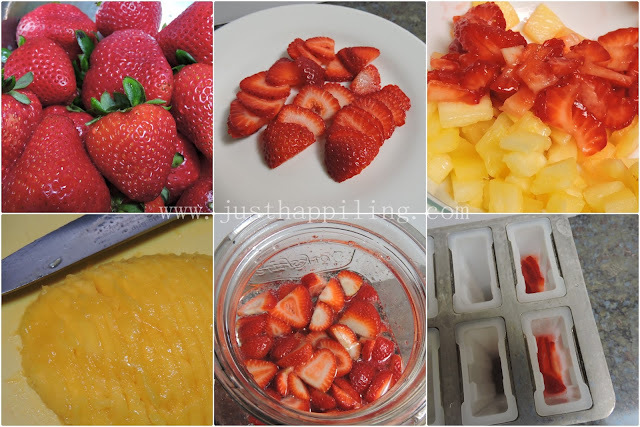 Add your strawberry bits to the popsicle molds, and alternatively add pineapple to some too. 3. You will be adding your pink juice to these molds. I like to do half, then place it in the freezer for a couple of hours, and then fill the rest of the mold with a mixture of yogurt and your favorite fruit of the same color; raspberry, strawberry, or any kind of berry. You can also use the mineral water alternatively with the pink juice to create different layers of color in your popsicle. Just be aware that it may overflow, so never fill it up all the way to the top when using a gassy liquid. As mentioned before. You can fill in your popsicle molds at different levels, then place in the freezer for a couple of hours, and add a different flavor, or choice of fruit or mixture to the rest to create multicolored/multiflavored effects. 1. Add your 2nd third of Strawberries. Preferably in big dices or chunks; your choice, to the big jug or container. Then add your remaining pineapple, which should be about 2/3rds, depending on how much you used for your popsicles. 2. Add loads of Ice, and then your mineral water of choice. I like using a brand from my hometown in Monterrey, Mexico. It makes me feel like home, plus it is very refreshing. I am lucky they sell it here in California. Be aware that you can skip the ice part, and just add the mineral water as is, then pop it into the fridge. If you leave it over night, your water will have a pink hue to it. That is it! Very simple to make. I used to order this drink at a popular restaurant in my hometown, but I've never seen it here in the United States, that is why I decided to make my own for the occasion. It would be perfect to survive the intense Summer heat of Southern California. 1. With the cucumbers, there are two ways to create flowers out of them by slicing them up thinly. One of them; once sliced, you place them in a row, and roll them up. You secure them with toothpicks and shape it. I am not very good with this one, so I try method 2; you cut your thin slices in half, and start shaping it in a spiral, starting from the outside, and working your way inwards. It will soon start looking like a flower. I use the thinnest slices for the center. 2. With the strawberries; very, VERY, carefully use a small and sharp knife to cut sections of your fruit. Start from the exterior and work yourself to the center. This is no easy task, and takes practice. I am not perfect at it, but that is why you use as many strawberries as you can, so that you can choose the best ones for your decoration. The beastly ones, you can blend them, or mash them and add to yogurt to create more popsicles. 1. There are a ton of videos online that you can learn from. Watch as many and observe all the different techniques, so that you can choose what works best for you. 2. Practice a lot! When you see fruit on sale, buy it and practice. Remember you can always blend what doesn't look as pretty and create something as delicious. 3. Be careful, and take your time. This takes a while to carve, due you have to do it carefully and gentle. Carving strawberries is not easy, and if not careful you could cut yourself. Take precautions. Tada! Your fruit flowers using strawberries and cucumbers should look something like in the picture above. Plus you can always spice it up a little by adding chilly powder to the cucumbers too. That's my favorite way to eat them. If you have extra mangoes, you can try creating fruit flowers out of mango too, as seen in the picture below. Now all you have to do is; serve and enjoy! So what do you think? Will you give any of these snacks a try? Let us know in a comment below. We love fun themed family activities and creating beautiful things. If you want to learn how to make the Beauty and the Beast inspired ~Enchanted Rose~ in the picture below CLICK HERE. This is a fun and easy way to create center pieces for your thematic birthday parties, or just to adorn a special area in your home. We also received these coloring and activity pages inspired by the movie, and you can get your own for free! These are great, to get your little ones excited about the upcoming release of the film. Free themed downloadable activities to enjoy with your family! Watercolors are so much fun and magical, that we had to use them for the coloring pages. Once your family has finished, share the pages with us using #BeOurGuest #BeautyandtheBeast #AlliedContigo. We would love to see them. BURBANK, Calif., May 12, 2017 — Disney’s “Beauty and the Beast,” the live-action adaptation of the studio’s animated classic, brought the story and characters audiences know and love to spectacular life and broke box-office records. Now the stunning, cinematic event arrives home on June 6 on Digital HD, Blu-ray™, Disney Movies Anywhere, DVD and On-Demand. “Belle” -- Filmmakers and cast reveal how it felt to shoot this memorable scene. “Be Our Guest” -- Discover all that went into creating this epic, primarily virtual performance. “Gaston” -- Join the cast for rehearsals and filming of this rousing, high-energy number. “Beauty and the Beast” -- You’re invited on set for the filming of this beloved, classic scene. Introduction by Director Bill Condon -- Director Bill Condon presents a collection of scenes that, for one reason or another, ended up on the cutting-room floor. Gaston Courts Belle -- Pleased with himself after settling a disturbance with the townspeople, a triumphant Gaston attempts to woo Belle. Bread and Jam for Agathe -- On her morning market rounds, Belle stops by to see Agathe, the village beggar woman. Storming the Ice Gates -- The angry mob of villagers, led by Gaston, overwhelms the castle’s defenses. Lumière Torches LeFou -- As the fight rages around them, LeFou scuffles with Plumette … until he experiences a sudden, extremely heated interruption. Monsieur Toilette -- LeFou escapes from the brawl into a small room, where he's startled by a castle resident. Cogsworth Rescues Lumière -- When Clothilde the fishmonger threatens Lumière, Cogsworth leaps into the fray. Treacle the Lasses -- Three village lasses chase Chip and Froufrou – Madame Garderobe’s dog-turned-footstool – into the kitchen, where a surprise awaits. LeFou and Monsieur Toilette Reunite -- After the spell is broken and the castle residents are returned to human form, LeFou and his new acquaintance meet again. “Days in the Sun” – Learn more about Beast’s childhood in an alternate version of this beautiful song, introduced by director Bill Condon. Disney Movies Anywhere (DMA) is an engaging and family-friendly cloud-based digital movie service that makes it easy to buy Disney, Pixar, Marvel and Star Wars movies once and watch them anywhere. Viewers can enjoy their digital movies from the comfort of their living room and across multiple mobile platforms by simply adding the free DMA app or channel to their devices, such as iPhone, iPad, iPod Touch, Android mobile phones and tablets, Android TV, Amazon’s Fire tablets, Fire TV and Fire TV Stick, Roku, and Xbox 360, and connecting to their DMA account with participating providers including iTunes, Amazon Video, VUDU, Google Play, Microsoft Movies & TV and Fios by Verizon. DMA users can explore Disney’s library of over 450 digital movies, discover hours of new and exclusive short-form content, redeem Digital Movie codes found in eligible Disney, Pixar, Marvel, and Star Wars product, and earn Disney Movie Rewards points with every digital purchase. We are so excited to be given the opportunity not only to enjoy this film as it is released, but to give one of our awesome followers the chance to bring this film home too! 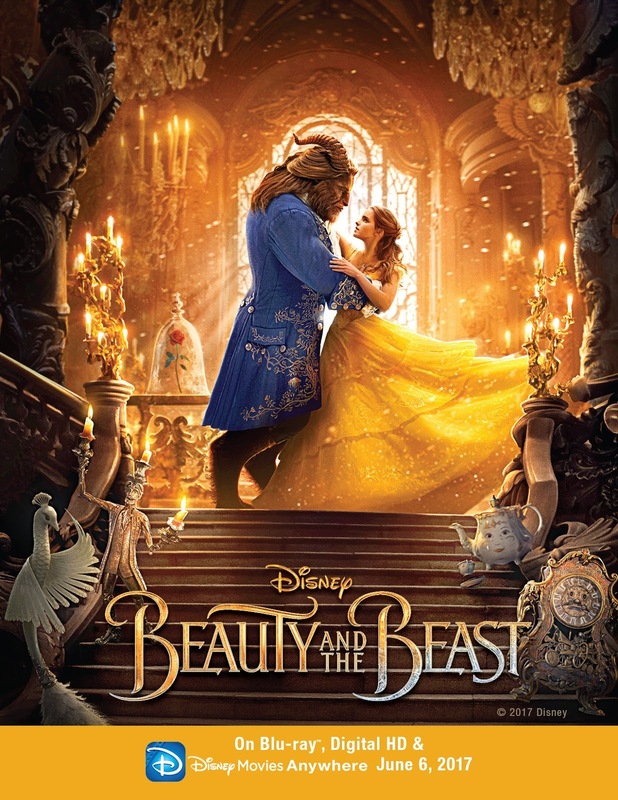 One lucky follower will win one digital copy of Disney's Beauty and The Beast. All you have to do is follow the instructions on the widget below. The more actions you do, or if you are a fan of us via social media, the more chances you'll have to win. This giveaway is open to US residents only. Must be at least 18 years old to participate. Only one participant per household is allowed. Cheating will not be tolerated. Anyone caught cheating will be banned from future giveaways. By entering this giveaway you acknowledge that you have read and agreed to all the terms and conditions of this giveaway and to release Just Happiling, and any social media venue from liability. Prize fulfillment is the sole responsibility of the sponsor for this event. This giveaway will start on June 4th, 2017 and will end on June 13th, 2017 at 11:59pm PST. Void where prohibited by law. Once the giveaway has ended, one random winner will be chosen among those who participated and will be contacted via the email provided. The winner will have 24 hours to claim the prize. Failing to claim within the 24 hours from notification, will lead towards choosing a new random winner. Make sure that justhappiling(at)gmail(dot)com is in your safe email list. We are not responsible if the winning notification falls unnoticed in your spam mail, sorry. Good Luck! Good Luck, and don't forget to come back daily to claim those entries. We can't ask you to like us through social media, but we would love it if you do. Sharing is caring, so please share with your friends who you think would love to win too. Any additional comments, we would love to read you. Until next time, remember to smile, because it's contagious! I'd like to win because Beauty and the Beast is my favorite Disney movie. Our favorite snacks are a selection of fresh tropical fruits include mangos, papaya and pineapple! I'd love to win because this is one of my favorite movies! We love snacking on fresh fruit. I would like to win because my daughter loved this movie. My family's favorite healthy snacks are any kind of fruit and nuts. The kids and I love Beauty & The Beast. We would love this to enjoy watching. My family loves Disney films. My siblings & I grew up going to the movies every Saturday (it used to cost a quarter to get in way back then) and Disney films were our favorite. We would sit thru the movie TWICE. Beauty & The Beast was one of our favorites, and we have shared our love of Disney movies with the kids, grandkids, etc in the family. I'd love to win this new version of Beauty & The Beast. My family loved Emma Watson in the Harry Potter films, and seeing her in Beauty & The Beast would be wonderful! My family's favorite healthy snacks are air-popped popcorn & frozen fruit bars.